Several sources report that Nintendo has filed a trademark for the following words that may or may not rhyme with Wii: Zii, Cii, Bii, Oii and Yii. 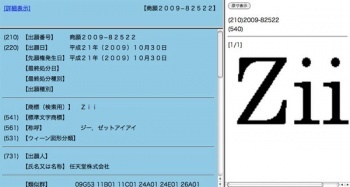 According to some digging by Silicon Era, Nintendo filed trademarks in Japan for the names and that the request was processed on October 30, 2009 but it didn't hit the Japanese trademark database until today. The request may have been a protection against other companies filing trademarks similar to the Wii. The trademark was apparently originally filed in 2007 and this latest was merely a renewal of the original request. So what the hell is a Zii? Despite Nintendo of America's Reggie Fils-Aime firmly denying that an HD Wii was in development, a Zii or a Yii might be such a device. Perhaps a Bii or a Cii (pronounced See or Kee?) is an unannounced peripheral for the popular console. My money is that the Oii is an adult-oriented vibrating pleasure stick. Oii! Creative is also working on an Android device with name ZII, but it wouldn't compete because of the capital letters. I can only imagine that Nintendo wants to protect its trademarks as much as it can, and this request is just to block more companies like Creative from using a similar name.